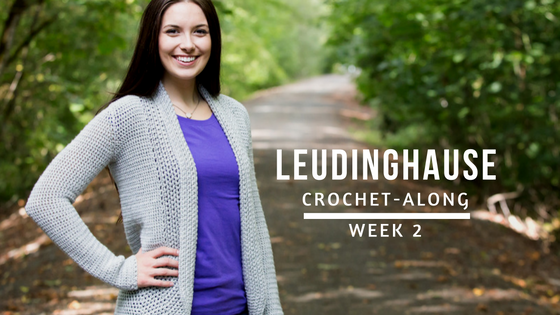 Welcome to Week 2 of the Leudinghause Crochet-Along! This week we will actually start our cardigan! Hopefully, you were able to meet gauge last week and are ready to get started because this week we will be making the body of our cardigan. Here is a video explaining everything for this week. If you are looking for specific information I have noted at what times I start talking specific things in the post below. At 13:46 I show how to add a new ball of yarn and then I explain why I don’t weave in ends as I go. A big thanks to Universal Yarns and Furls Crochet for the supplies for this CAL! (1:57) Row 1: Fsc 72 (88, 100, 116, 132, 148, 160). Repeat row 3 until you have 10 total rows. You will be adding 2 sts each row and end with 90 (106, 118, 134, 150, 166, 178) sts. Repeat row 11 until you have 48 total rows. (15:44) Because the fabric is reversible this can be your left or right front. (16:19) Row 1: Ch 1, turn, esc in the 1st 13 (17, 20, 24, 28, 32, 35) sts. (21:25) Return to the last row of the bottom, skip 4 sts, join to the next unworked st. Note: I do not show making this is the video as it is just a mirror of the first front. You can see it completed at 25:00. Return to the last row of the bottom, skip 4 sts, join to the next unworked st.
(26:12) With wrong sides facing out (pick any side you’d like), slip stitch the shoulder seams together. Once you have finished your body put it on! I know you want to! This will give you a pretty good idea how the cardigan will fit. However, keep a few things in mind. 1. You gauge may have changed after washing so likely it will loosen up a bit. 2. you will be adding 6″ of trim to the front, back of the neck and bottom so it will be pretty small. Feel free to take a tape measure to different parts of the cardigan to see how far out that trim will come.